Long Series. Confederation Centre of the Arts. Assembly Lines, 2011-2012. I am currently seeking exhibition opportunities for my Long Series of paintings. The Long Series is primarily mixed media on paper. Each piece is constrained to roughly 12×12 inches. Within the series the exploration of drawing, painting, collage, and unusual materials such as tape, objects, and found papers are exploited. The use of accident, contrivance, simulation, and collaboration with other artists and the public have also been utilized. The project explores the effects of a long-term project on the development of a personal iconography. Certain marks such as cross-hatching, stains, ink rings, decoration, and scribbling are intentionally carried throughout the series. Because of the length of the project, when a new mark or idea occurs it is often developed into a series within the series and explored to completion and then moved on from. The goal of the project is to create 10,000 pieces in the series, and to date over 1400 have been completed. 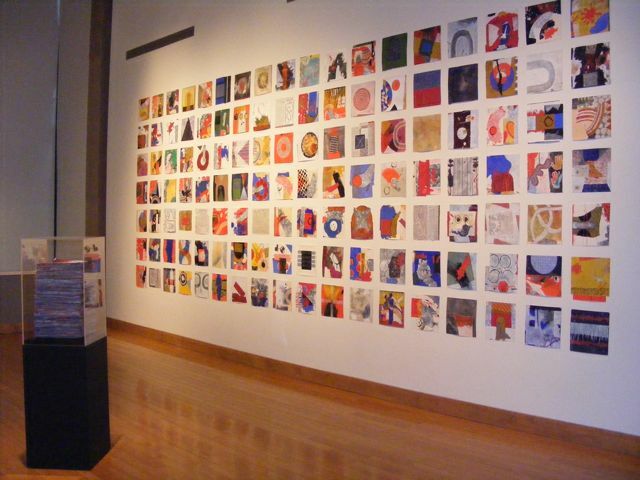 The works can be shown as single framed pieces, or as large unframed grids of paintings that can be pinned to a wall. Work from the Long Series have been exhibited in the following exhibitions. Now you see it, now you don’t, Terrace Studios and Gallery, London, UK, 2013. Assembly Lines Confederation Centre of the Arts, Charlottetown, PEI, Canada, 2011-2012. HI Stephen, Happy New Year! I was just pondering your long series, and thought that it would be amazing to see it out West here … have you thought about applying for an exhibition at either Harcourt House Artist-Run Centre or to Latitude 53? The Projex Room at Latitude would be a great space to show an extended range of this work, and there’s potential in Harcourt’s Project Space for a smaller show, or a larger show in the Main Gallery. Just a thought! Best to you and yours.